A conference and convention centre is the ideal venue for digital signage, providing your visitors with directional information, event information and centre information..
Command's digital signage and wayfinding systems provide an efficient method of providing the right information for thousands of visitors. With large converence centres, the controlled movemement of people is virtal. Displays can be individually controlled to provide directional information. Wayfinding screens with directional arrows that are located around the venue. 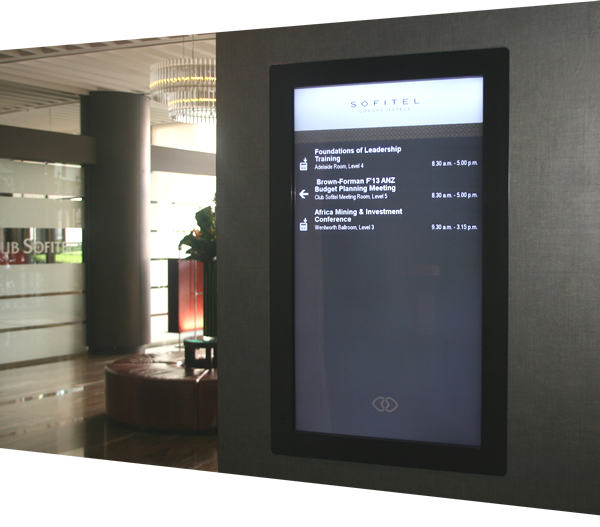 Wayfinding screens can be located at key locations for the directional assistance to visitors. The off-the-shelf software has the flexibility to design the path layouts and generate the quickest path to the location selected. Each kiosk has its own wayfinding software plans and mapping, but each has its own individual “You Are Here” points. Easy to use for fast deployment. The system determines the best route from that location and supports multiple venues, multiple levels and can even direct outside of the conference centre. A wayfinding system can be used for both the conference centre and the internal event, directing visitors to stand locations. Every conference centre has a food outlet area. The Navori QL system displays and controls content and displays digital menu board content with ease. Need to change pricing - not a problem. Open Navori's Data Feed Manager and make the change in seconds..
With all these displays, advertising can be incorporated with statistics information retrieved from the system, such as Where, When and How Often did the ads display. The system will then allow the generation of reports which can then be exported to a booking or invoicing system..
SMS advertising is supported by sending out an SMS signal in conjunction with a displayed media file. A section of a display could display Twitter feeds for user feedback. A QR Tag can be displayed on the screens – users can scan the code with their mobile phone to receive access to more information. Navori includes a Trigger SDK. This allows the development of any type of application to activate a media file or even a play list. As an example, when a player scores a try, a trigger could activate the profile o the player which is then displayed on the IPTV system. Navori supports LCD and Plasma displays of any brand. Navori supports the input to large scale LED displays typically seen around stadiums.. The Navori interface can now be accessed through an advanced interface in Internet Explorer. Multiple users can access the system to manage the system and events. Instant updates can be sent to all screens at any time. The system also supports user management where a user can be assigned to a single group, a single screen or even a single zone on a screen.